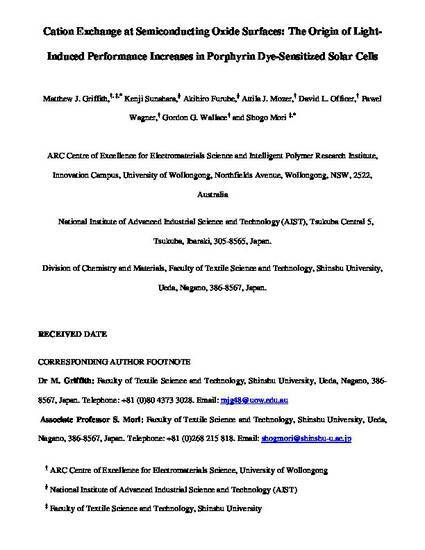 Griffith, M. J., Sunahara, K., Furube, A., Mozer, A. J., Officer, D. L., Wagner, P. W., Wallace, G. G. & Mori, S. (2013). Cation exchange at semiconducting oxide surfaces: Origin of light-induced performance increases in porphyrin dye-sensitized solar cells. The Journal of Physical Chemistry C: Energy Conversion and Storage, Optical and Electronic Devices, Interfaces, Nanomaterials, and Hard Matter, 117 (23), 11885-11898. The origin of simultaneous improvements in the short-circuit current density (Jsc) and open-circuit voltage (Voc) of porphyrin dye-sensitized TiO2 solar cells following white light illumination was studied by systematic variation of several different device parameters. Reduction of the dye surface loading resulted in greater relative performance enhancements, suggesting open space at the TiO2 surface expedites the process. Variation of the electrolyte composition and subsequent analysis of the conduction band potential shifts suggested that a light-induced replacement of surface-adsorbed lithium (Li+) ions with dimethylpropylimidazolium (DMPIm+) ions was responsible for an increased electron lifetime by decreasing the recombination with the redox mediator. Variation of the solvent viscosity was found to affect the illumination time required to generate increased performance, while similar performance enhancements were not replicated by application of negative bias under dark conditions, indicating the light exposure effect was initiated by formation of dye cation molecules following photoexcitation. The substituents and linker group on the porphyrin chromophore were both varied, with light exposure producing increased electron lifetime and Voc for all dyes; however, increased Jsc values were only measured for dyes containing binding moieties with multiple carboxylic acids. It was proposed that the initial injection limitation and/or fast recombination process in these dyes arises from the presence of lithium at the surface, and the improved injection and/or retardation of fast recombination after light exposure is caused by the Li+ removal by cation exchange under illumination.